Go Trump, Mattis. Communists by nature are 100% bullies and dictators. They bully their own citizens, they bully their weaker and smaller neighbors. Someone should show them they cannot bully everybody. Early this week, the Pentagon sent two of their battleships at the SCS to conduct their regular freedom of navigation operation (FONOP). 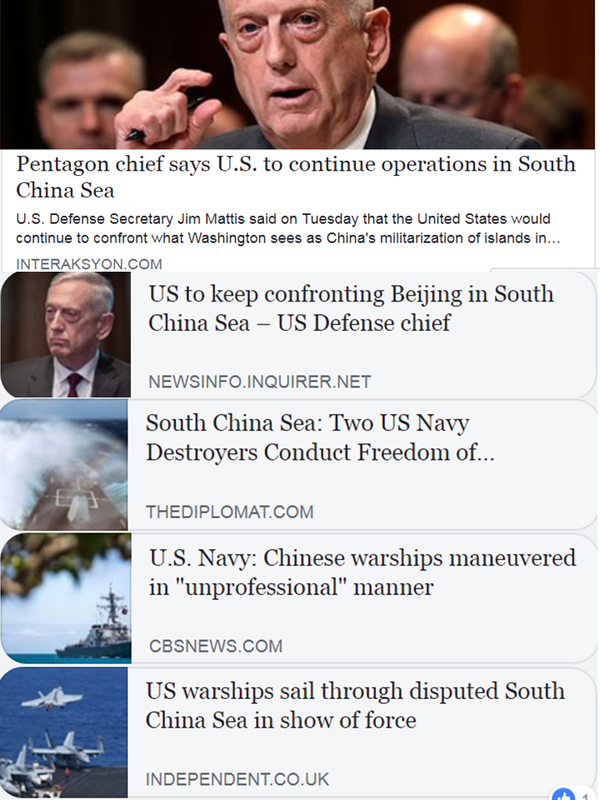 China bully of course protested because they "own" the whole of SCS within their self-concocted 9-dash line, only a very small area outside those lines are left with other ASEAN countries that claim territorial ownership of those islands, islets, atolls, shoals, etc. The international rule of law should prevail. at the SCS. The UN-backed Permanent Court of Arbitration (PCA) at The Hague, Netherlands has ruled in July 2016 that China's claim of ownership at the 9-dash line is illegal, no international basis.